Magdalena, NM; July 12, 2017 – For Immediate Release – The Taylor Canyon Fire, located on the Magdalena Ranger District, is now at 2,336 acres. The lightning-caused fire started on July 6 and is located in Taylor Canyon, 55 miles west of Magdalena, NM, in the San Mateo Mountains. Approximately 62 personnel are assigned to the Taylor Canyon fire. Resources include two Wildland Fire Module, one Type 2 IA Crew, three Type 6 Engines, one Type 4 Engine, and one Type 3 Helicopter. Resources from the U. S. Forest Service, Bureau of Indian Affairs, Bureau of Land Management, New Mexico State Forestry, Returning Hero’s Program; and the City of Rio Rancho are currently assigned. Decisions related to management of this fire will be based upon minimizing exposure and risk to fire fighters. After touring the Taylor Canyon Fire yesterday, District Ranger Kim Obele stated “I am very happy with the low intensity results we are seeing from this fire, this particular part of the Magdalena District is our priority landscape and it needs periodic fire to return it to a resilient landscape. This means improved watershed health, more diversity for wildlife and plants, as well as the ability to tolerate fire in drought conditions”. The fire continues to creep along the ground, backing down ridge lines in previous treated areas consisting of Ponderosa Pine, Pinyon, Juniper, grass, and brush. Today, crews will continue to monitor active areas of the fire. Aerial ignitions on both BLM (Bureau of Land Management) and Forest Service lands will continue as weather permits. Hand ignition operations are also planned for the operational period along the southeast perimeter of the fire. STAGE I Fire Restriction are in place in the San Mateo Mountains. At this time, there are no road advisories or closures in place. Monsoonal moisture continues to gradually increase across the area bringing a possibility of showers and thunderstorms. These predicted storms have a moderate chance of producing wetting rain. 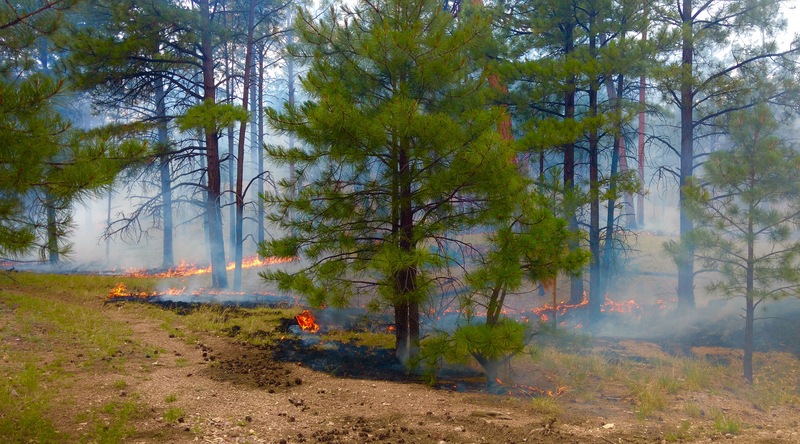 Smoke may be visible from US Highway 60 as fire behavior increases. Smoke can hurt your eyes, irritate your respiratory system, and intensify chronic heart and lung problems. Your eyes are your best tools to determine if it’s safe to be outside. If you are having health effects from smoke exposure then take extra care to stay inside or get to an area with better air quality. You should also see your doctor or healthcare professional as needed. For information on air quality and protecting your health, and to find guidelines on distances and visibility, please visit http://nmtracking.org/fire.